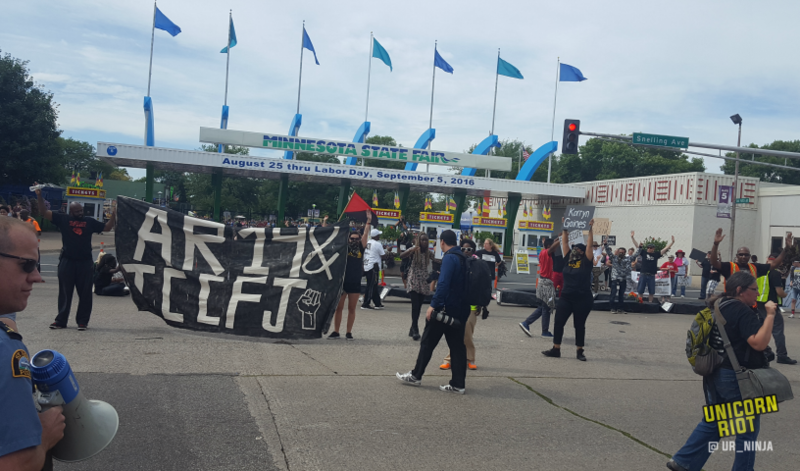 St. Paul, MN – Up to 100 people disrupted the main gates to the Minnesota State Fair and surrounding traffic for over two hours on Saturday afternoon with messages of Justice for Philando Castile and Black Lives Matter. On the day that Philando Castile’s family lay him in his final resting place in St. Louis, the community congregated at the site of his murder by police. On Larpenteur Avenue next to Fry Street in Falcon Heights, a suburb of Saint Paul, Minnesota a rally happened before noon and later a march to the fairgrounds. Several family members of victims of police murder were in attendance at this event. 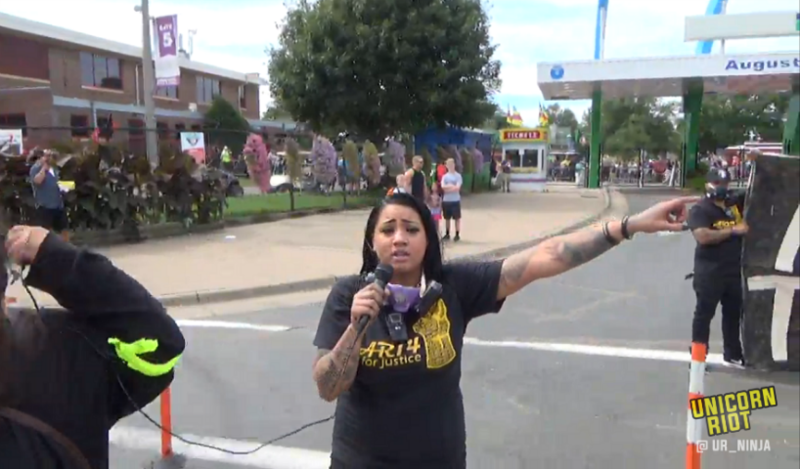 A cousin of Map Kong, who was shot in the back by police in March 2016 in a McDonald’s parking lot in Burnsville, Minnesota, spoke before and after the march and thanked everybody for showing solidarity for victims of police murder. 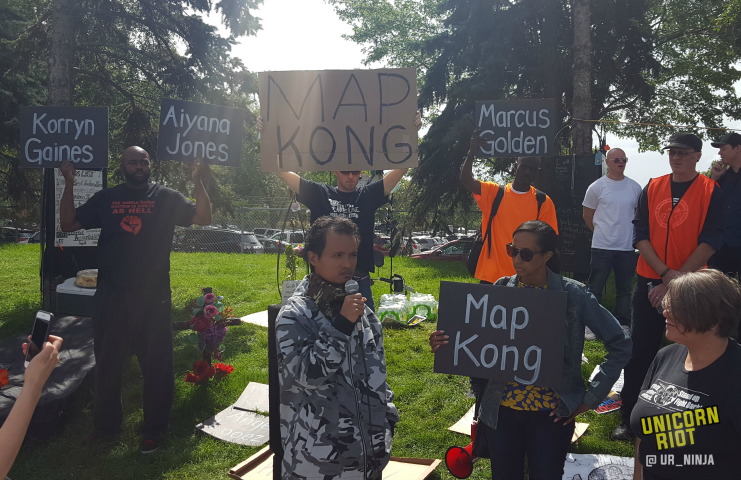 Monique Collars-Doty (seen holding the “Map Kong” sign in the picture above) an Aunt of Marcus Golden, who was murdered by St. Paul police in January of 2015, hosted the speaking part of the rally. A family member of Eugene “Geno” Smith, murdered also by St. Paul police, was present during this action and specifically thanked the creator of the name signs as she took the one labeled ‘Geno Smith’ home with her. Geno was murdered by Joshua Raichert, a St. Paul police officer with a decade plus experience and two other murders under his belt, that of Victor Gaddy and John Charles Carr. A little after noon, dozens flooded into the streets from the vigil site of Philando Castile. Below is the march as it occurred live. 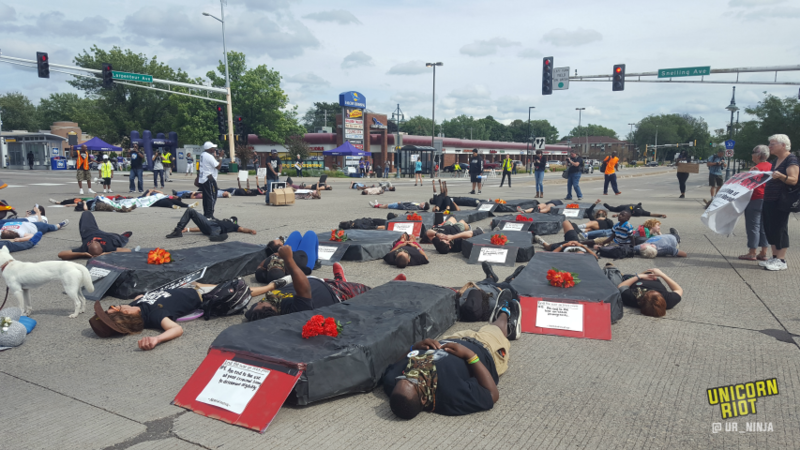 Protesters defied dozens of dispersal orders made by St. Anthony and St. Paul police officers; they marched down Larpenteur Avenue to Snelling Avenue where they made a southward turn towards the gates of the State Fair after they staged a die-in. This march clogged traffic up and down Snelling Ave. for hours. The police had already closed and locked down the main gates of the fairgrounds by the time the protesters reached them. The protesters took up space, chanting and giving time for speeches. 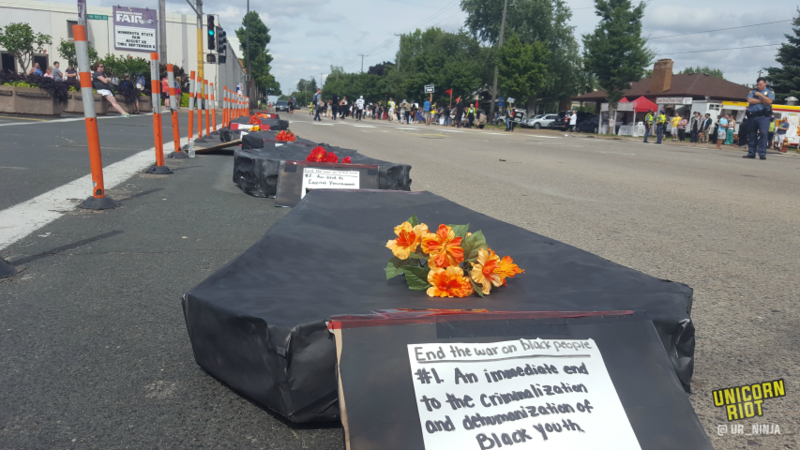 AR-14, a youth-led collective, brought ten coffins that on one side signified ten ways to “end the war on Black people” and the other side had a setting for a murdered victim of police. One of them read the story of Jamar Clark, “I was murdered for checking on a friend. 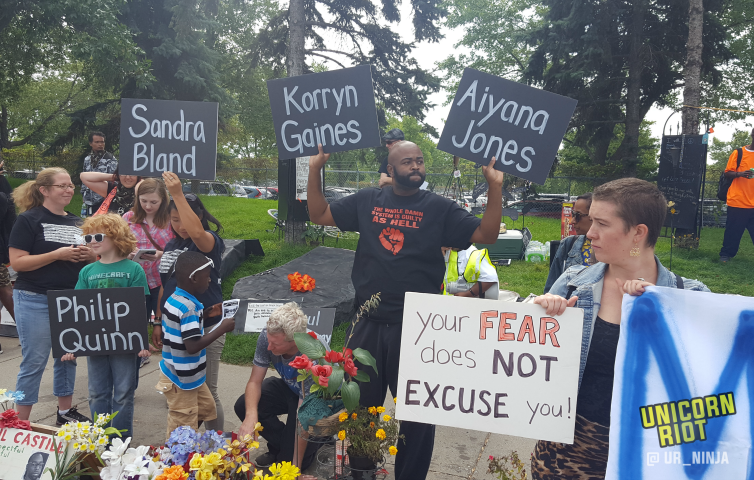 Officers Mark Ringgenberg and Dustin Schwarze murdered me on November 15, 2015.” When the coalition of community members left the site of the gates, they left the laid out coffins, except Philando Castile’s, on the ground in front of the State Fair. After taking space in front of the fairgrounds, effectively blocking the access to thousands of people over a span of an hour, the protesters, again, defying dispersal orders, marched back to the site of Philando Castile’s murder. The event ended without any arrests or adverse incidents. The ruling in Philando Castile’s murder by Jeronimo Yanez is in the hands of Don Lewis and Ramsey County Attorney John Choi. An announcement is expected soon to see if Officer Jeronimo Yanez will be charged with any crime. As stated by the organizers of this event (which included Twin Cities Coalition for Justice), no LEO “has ever been convicted of a work related homicide”. Unicorn Riot will continue to cover events surrounding Philando Castile, including an upcoming protest on Tuesday, September 6, which you can watch live here. 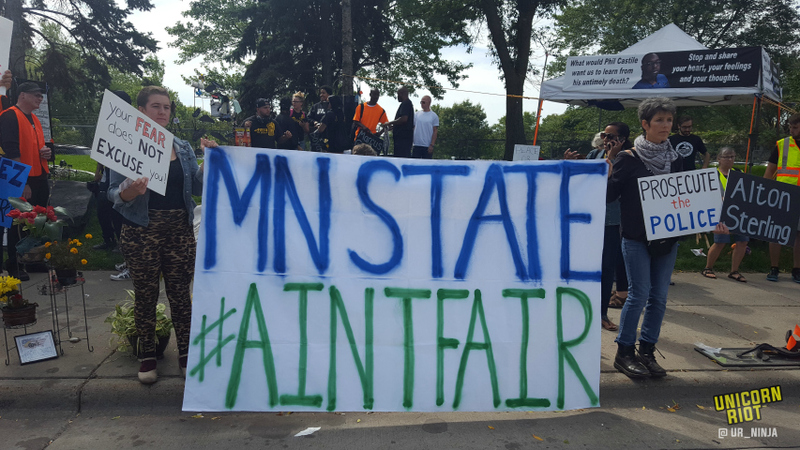 To view the full uncut livestreams of MN State #AintFair, see below.